SKU: 691017543. Category: Solar Energy Systems. Tag: parabolic dish solar cooker. Use sunshine to boil water or cook meals and food, energy saving and eco-friendly Can reach high temperature up to 1200°C, capable for boiling, cooking, stewing etc. 9 )Reflector panel’s material: Magnesia. Why people would like to choose using solar cooker? The solar cooker can directly to boil water and cook under the direct sunlight. The highest temperature from focus places as high as 1200 °C which can meet various kinds of cooking ways, such as steam, stew, boil, braise, etc. First, economic benefit and social benefits. No burning coal, no using electricity, no burning gas and firewood which will save large fund in daily cooking. The solar cooker has a wide range of USES which can boil water and steamed bread, boiled rice porridge, stewed meat, etc. Second, no carbon emissions way of life which improves people eating conditions and health level? If only to boil water and to cook, so it is way of natural pollution-free, no smoke without oil dirties. At the same time can reduce large burned to protect the ecological environment. 1. Can we use solar cooker as emergency cooker without any electrical power or fuel? Whether you’re dealing with a power outage, or just plain conserving energy, the Solar Cooker can cook anything that can be baked in a conventional Cooker. It lets you harness the power of the sun to cook without fuel. 2. What kinds of recipe that solar cooker can do? With the Solar Cooker you can cook almost anything – breads, cakes, muffins, pizza, vegetables, poultry, fish, meats, casseroles, grains, pasta and desserts, just to name a few. 3. Does solar cookers can provide enough temperature for cooking? Our Solar Cookers reach temperatures of 1000 degrees Fahrenheit, which are more than sufficient to bake, steam your favorite foods – wherever you happen to take your Solar Cooker. Can we get good taste food as well as cooked by traditional cooking way at home when we use solar cooker to do cooking? Sun-baked foods stay moister and have less shrinkage than conventional Cooker-cooked foods. Also, with the Solar Cooker there is never any burning or scorching to ruin a meal. 5. Is totally safe to use solar cooker from MARSROCK? Because of the unique way the Solar Cooker operates, there is never a danger of fire. The faceplate is made of high quality carbon steel material, never deformation, durable; And the surface of faceplate was coated by electrostatic spurted plastic, which is free maintain but long life of 10 years. You can take and use the Solar Cooker virtually anywhere there is sunshine. Is a Great Hedge against Power Interruptions? 8. What types of Solar Cookers we can choose? Mars Rock designs three types of solar cookers to meet people daily life’s demand based on the different needs and different budget. This type cooker installed with a track sun sensor, motor system and needs 220V AC power source, you can use AC power at home. This type cooker installed with a track sun sensor, motor system and 25W Solar PV panel energy system, off grid. So it can be used anywhere as long as under sunshine. People often buying for the lowest price. As we mentioned model number from MRSC1000 to MRSC2200. 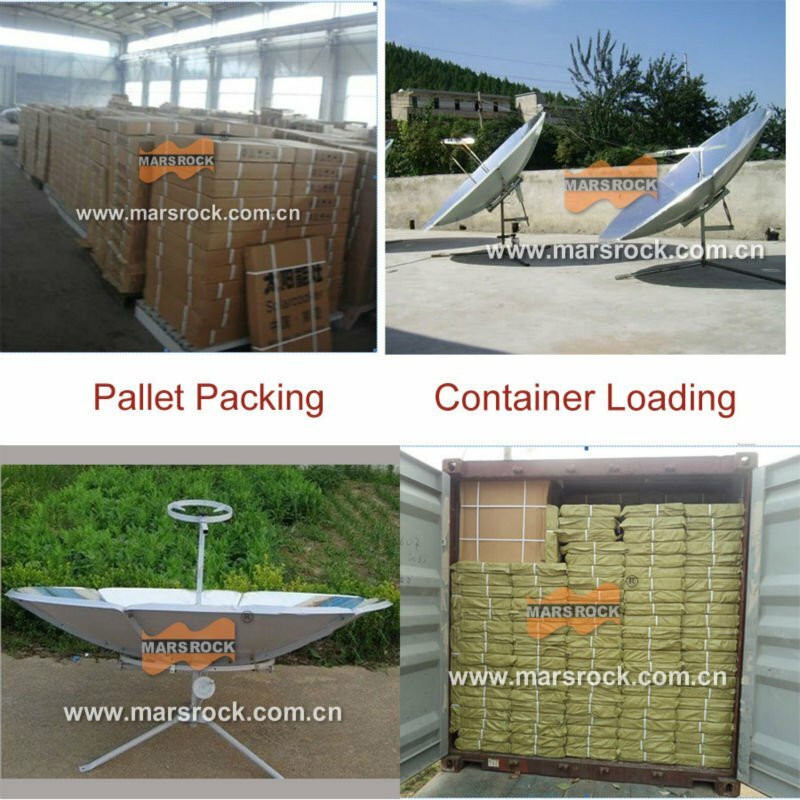 What are the features of solar oven from MARSROCK? 1>As long as 10 years life. 2>The compact structure of solar oven is compact. So it is easy to be installed and easy to be operated, and can be used outdoor all-weather without maintenance! 3>The oven is composited by six pieces of faceplates. Whose weight is light and convenient disassembly, installation, carry. It’s suitable for long distance transportation. 4>Reflector is made of carbon steel with highly reflective Al film (reflectivity> 85%) Spray coating surface. The pulley & lever principle design improves the efficiency of condenser regulation in more short time and more less stress by hands. So it is easy to be carried. 5>Accurate gathered precision to ensure the focus position of high temperature. 6>Best investment in one time by get ten years benefit. 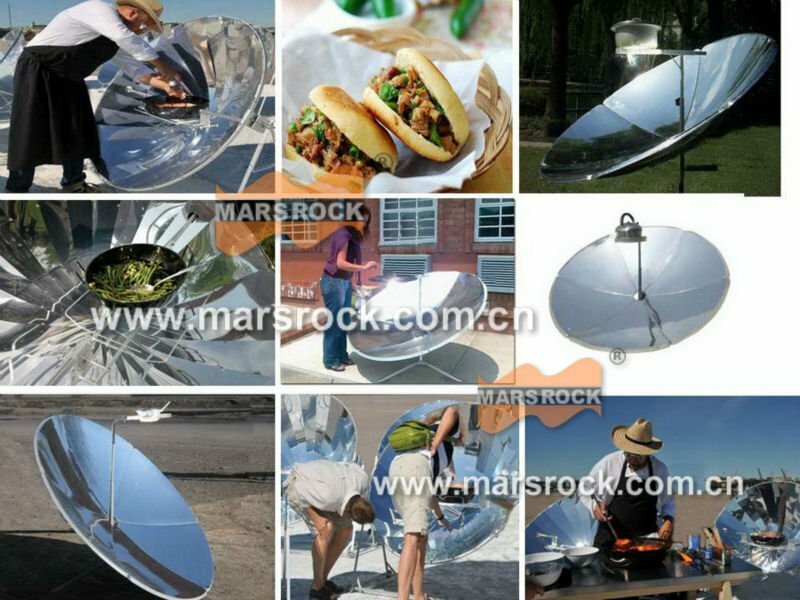 What place is suitable for use MARSROCK solar cooker? It is specially suitable for people who boils water, steams, boils, cooks in countryside, gardens, mountainous areas, for cooking of traveling, camping, and so on.